A joint intelligence assessment by the FBI and the Department of Homeland Security (DHS) described the communist extremist group Antifa as committing terrorist activities as early as last year. Antifa uses violence as a tool for intimidation and suppression. In particular, it often lashes out at conservatives whom it places under the blanket label of “fascist,” then uses the label to justify its actions. President Donald Trump criticized Antifa alongside the KKK and neo-Nazis, following a violent clash in Charlottesville, Virginia. Trump was criticized by many left-wing politicians and news outlets, however, since he denounced Antifa—which many on the left were at the time defending. “There was a group on this side, you can call them the left. You have just called them the left, that came violently attacking the other group. So you can say what you want, but that’s the way it is,” Trump said. Despite the criticisms against Trump at the time, however, many left-wing politicians and news outlets are now making similar statements against Antifa. 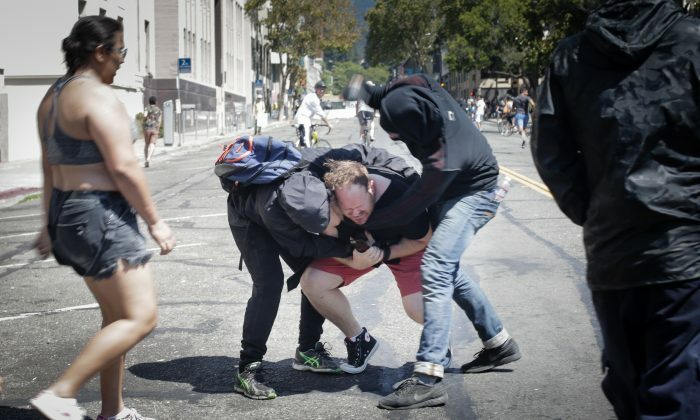 This was particularly so after videos emerged of Antifa members beating and viciously kicking people on the ground, following cancelled events of a “Patriot Prayer” rally and the “No to Marxism in America” rally in Berkeley on Aug. 27. He noted that both Neo-Nazis and Antifa promote violent ideologies. The Nazis killed an estimated 25 million people, and communism has killed an estimated 100 million people. “There is no difference between those who beat innocent people in the name of the ideology that gave us Hitler and Himmler and those who beat innocent people in the name of the ideology that gave us Stalin and Dzerzhinsky,” he stated. The White House may respond to a call to openly label Antifa as a terrorist organization. A petition calling for this designation on Antifa required 100,000 signatures by Sept. 16 to get a White House response has already received over 334,000 signatures, as of Sept. 1. Antifa is already categorized as a domestic terrorist threat by New Jersey’s Office of Homeland Security and Preparedness.